This is just too rich not to write on. Take a gander at the controversial cover of “My Turn,” Doug Henwood’s new book about Hillary Clinton. Liberals are having a total meltdown over this. Liberals overwhelmingly think the art is disgusting. I think it perfectly captures the ‘bitchiness’ of Hillary Clinton. It seems to say, ‘It’s my turn to be president and if you get in my way, I’ll take you out.’ What has the leftists in a serious spin is the gun she’s holding. Now, that’s irony. James Fallows says ‘Contest is over. Best book cover of 2015…’ I have to agree. I would never read the book though. It’s a bunch of liberals duking it out over Hillary’s ‘electability’ and the fact that she’s so corrupt, that not even Democrats can stomach her. It’s not just Republicans who get riled by the thought of Democratic front-runner Hillary Clinton ascending to the presidency. Some people on the left lock horns over Clinton often enough to suggest that Team Hillary still has a long way to go before she has shored up the traditional base of progressive voters. A controversial book cover is the latest flashpoint to lay bare the divisions in the Democratic base over the Clinton candidacy. The forthcoming book, “My Turn,” by Nation Magazine Contributing Editor Doug Henwood, critiques the former secretary of state’s decades-long political career, calling out her foreign policy positions and purported connections to big-money interests, among other contentious points. 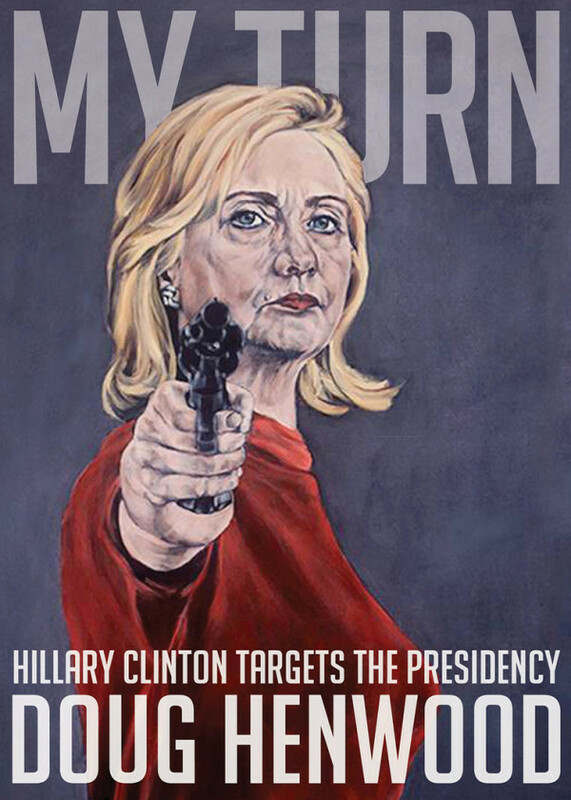 And the book cover’s flamboyant illustration – featuring a stoic Hillary Clinton, in a blood-red dress, pointing a gun at the reader – has sparked a heated debate among her supporters and detractors. Even the author and the artist have different takes on the imagery. But the intimidating image glaring out from the front of “My Turn” was created long before Henwood penned the book, which he says was developed out of the Harper’s piece and goes into greater detail about “her long history in shaping the ‘New Democrat agenda,’ ” — an agenda which “she now purports to be running against,” Henwood told MSNBC. And then there’s Sole, a diehard Clinton supporter and also a fan of Henwood’s, according to International Business Times. Sole debuted the painting, along with other similarly themed pieces, last year. Later, the pieces were published in Politico magazine under the headline “Extremely Ready for Hillary,” according to theInternational Business Times. “I love Hillary Clinton, I support Hillary Clinton, I very much want her to be president. I will certainly vote for her,” Sole told International Business Times. “What I don’t get is the reaction that calls the cover sexist,” Henwood told MSNBC. “Hillary is tough and determined, characteristics that shouldn’t be seen as off-limits to women. The political question is what she or anyone else does with toughness and determination, and that’s what my criticism of her focuses on. The cover was meant to get a reaction and boy howdy, did it! She looks just like the ruthless hag that she is on the cover. I also believe that the gun, which is meant to depict her as a heartless killer, is way more than apt here. It’s profound. That woman would literally do anything to become president. Anything. It’s not Hillary’s turn to be president. Not because she’s a woman… not because she’s a Marxist/elitist… not because she’s a Democrat and certainly not because she’s a Clinton. The haughty, vicious face on the cover is a very good likeness of the Hildabeast. I like it… a lot. Now, if instead of a red dress, she was wearing an orange jumpsuit behind bars, I’d call it a masterpiece. Maybe it will happen in the revised edition.